The nights are warmer, the days are longer, and beekeeping is on our minds. 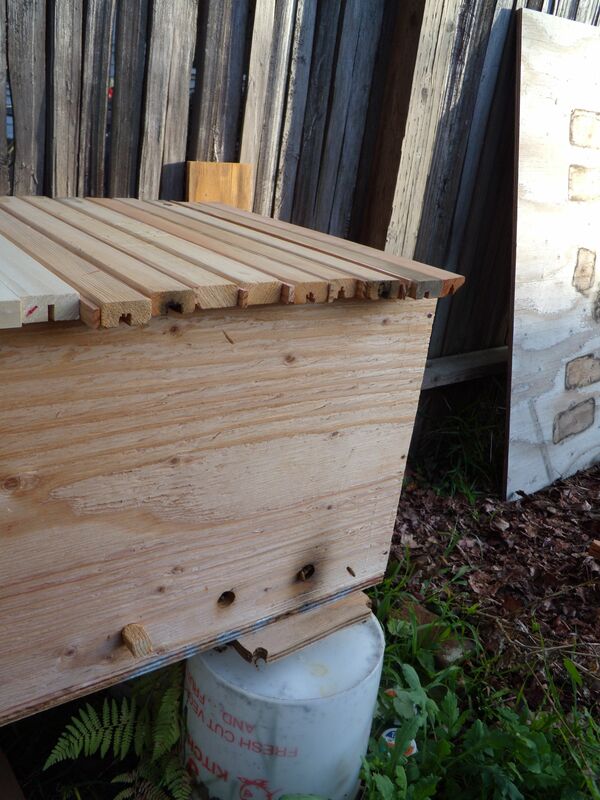 Our top-bar hive, Mondo, beat the odds and made it through the winter despite high mite counts in December and early January. Now the bee population is skyrocketing. When we peered up into the hive last week, we were met with the smell of honey and the sight of newly drawn comb covered in bees. 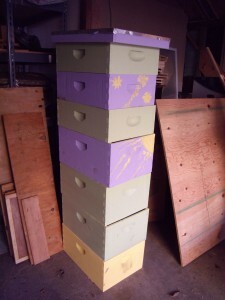 We had reduced the size of the hive for winter, and decided that it was time to give the bees more room. We moved over the board that had divided the hive in half, added extra top-bars, and voila! A view of Mondo's top-bars after we removed the outer cover. An inventory of our bee boxes, which have been overwintering in the garage, reveals that we’re due to place an equipment order (and/or get out the hammer and saw) if we want to keep more than five hives this year. And we do. A leaning tower of Langstroth brood boxes and honey supers (the brood boxes are the bigger ones). We’re in conversation with several of my fellow San Mateo County Master Gardeners about the possibility of keeping hives in their gardens. We made three field trips last weekend to meet potential beehive hosts and have another three scheduled for this weekend. We will miss watching all the hives from our kitchen window, but we’re excited to expand the apiary. How many hives will we keep? We’re not sure, but we’ve tossed around numbers like 8 to 12. Last year, we populated each of our first two hives with 3 lb. packages of commercially bred bees. This year, we’re hoping to get most of our bees from swarms, thereby (in theory) letting the bees figure out their own genetics and better adapt to our area. Kelly put out calls tonight to several beekeeper friends and acquaintances who told us in the past that they might be able to provide us with some swarms. Now we have to sit back and wait to see how lucky we get. From what I understand, swarm season starts in March around here and lasts through part of the summer (one of our hives swarmed in late June last year). A lot has happened in the past week. The girls have grown considerably. Their wing feathers are coming in, and their tail buds are sprouting feathers too. Believe it or not, I think they’ve gotten slightly quieter and significantly less smelly. 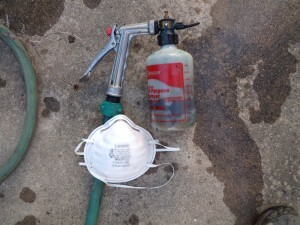 We made a trip to a chicken vet last Friday, who prescribed a round of twice daily antibiotics for two weeks to treat the mysterious sneezing, though she acknowledged that it could well be a virus that’s ailing them. It’s hard to tell if the medicine has done the original sneezer, now named Olive, any good. What I can say with certainty is that the other chicks have begun sneezing too, though much less frequently than Olive. Unfortunately, administering the antibiotics is highly stressful for everyone involved. The chicks hate getting a syringe of peanut-butter-flavored goo down the gullet and have become adept at shaking their little heads back and forth and clamping their beaks shut. While I hold the bird in one hand and steady its head with the other, Kelly opens the beak and sticks the tip of the syringe past the point where the bird could aspirate the medicine. Yikes! The whole ordeal involves a lot of frantic chirping. When they know they’ve been had, the babies close their eyes, and tremble, and break our hearts. The chicks survey the outside world for the first time. This past weekend, we took the babies outside for the first time and began supplementing their medicated chick feed with fresh greens and bugs. This was at the vet’s suggestion. She informed us that our avian children are at the age where their mother would be showing them the world and introducing them to new foods. Late Saturday night, Kelly and I went on a garden expedition in search of grubs and greens. We were unable to find the cabbage moth larvae we had hoped to offer them, but we did score several sow bugs, a slug, weedy grass with roots and dirt attached (they adored the dirt! ), and a mix of lettuce, spinach, and aphid infested kale. The babies were uncertain at first what to make of this bounty, but within a few minutes Luma’s curiosity got the best of her. She may be a week younger than the others, but our little Barred Rock has become a fully integrated member of the group. As it turns out, she may also be the most competitive, running frantically around the brooder box to keep her prize bugs away from the other chicks, and snatching choice tidbits out of her sisters’ beaks. 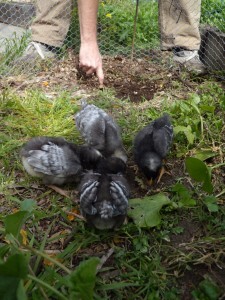 On Sunday, we set up a little round of chicken wire outside in the dirt and leaf litter and let the chicks run around in the sun. Once again, they didn’t know what to do for the first minute or so. They stood in a huddle and blinked up at the sky. It wasn’t long, though, before they started pecking, and scratching, and tearing around after each other. I’m learning a lot about chicken psychology. For instance, everything is more interesting if another bird already found it. The biggest, fattest, most succulent grub can be sitting three inches away, but the chicks will pass it by repeatedly, until one of them picks it up. From that moment on, they are all hell-bent on stealing it for themselves. 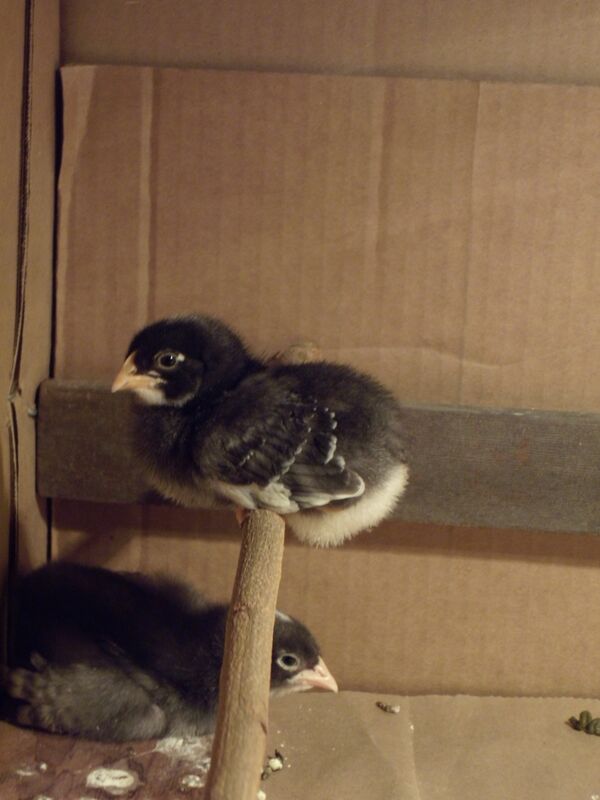 Even with Kelly’s super deluxe, reinforced cardboard box, I’m worried that the chicks may soon outgrow their space. With their new wing feathers, they are making running-hopping-test-flights down the length of the box. They have figured out how to get up on the perch that Kelly installed for them and Luma, in particular, seems to enjoy sitting on it and preening. I see a coop-making Saturday in our very near future. Luma, the baby Barred Rock. 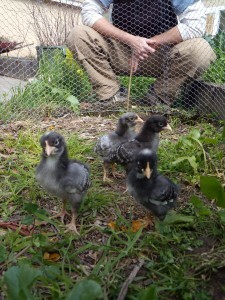 The Barred Rock chick, Luma, joined the flock last Friday night. Though she initially suffered the consequences of being a week younger than the others and a newbie to the group, everyone seems to have adjusted well to her presence. They no longer go out of their way to feed around her feet, or peck her senselessly while she tries to sleep. In fact, I’ve seen her get in a few good pecks at other chicks in the past days. Ironically, the chick nicknamed Mellow for its sleepiness the night we brought her home seems to have landed the title of top chick. She walks over the backs of her sleeping sisters occasionally to remind them all that she can do what she pleases, and she is fond of taking running leaps to see if she can scale the feeding jar. 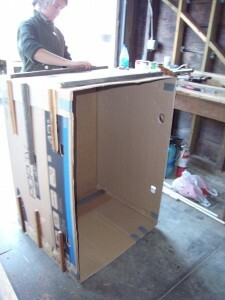 Kelly spent long hours on Sunday afternoon making a bigger box for the chicks to live in, so Mellow and the others now have all the room they want to run and test their wings. Kelly puts the finishing touches on the new brooder. From the night we brought them home, Kelly and I noticed that Spotty (she still hasn’t graduated to her real name) sneezed occasionally. Since she seemed healthy and energetic other than the odd sneeze, we decided to wait and watch. Unfortunately, the sneezing has increased noticeably yesterday and today, and I called some chicken-loving friends this morning to get their input. They directed me to their favorite chicken vet, who was kind enough to talk with me briefly over the phone. Apparently chicks, like humans, can sneeze for any number of reasons. Bacterial and viral infections are both possibilities, but as long as Spotty remains active and bright-eyed, without any discharge from her eyes or nares (bird nostrils), the vet said we can continue to play the waiting game, and see if she improves. It's good to have friends to lean on at nap time. In a fit of love-stricken spontaneity last Tuesday, Kelly and I drove half an hour to the nearest real farm supply store and brought home three week-old Barred Leghorn chicks. They cried in their box the whole way home and promptly fell asleep as soon as we got them set up under a heat lamp. They did a lot of sleeping and pooping that night, and we hovered over their cardboard box, alternately cooing at them, guffawing at their baby antics, and fretting over their wellbeing. Let me just say now that neither of us really knows what we’re doing, and we’re both terrible worrywarts. As it turned out, there was reason to be concerned. One of our new tinies (she currently answers to spotty, or spot-on-the-head) had a gob of dried poop partially blocking her vent. Fortunately, her concerned adoptive mothers did a little hasty Internet research and discovered that this is a potentially fatal condition in chicks known as pasting up, and that it is imperative to remove the offending gob regardless of how strongly the chick objects. And so it was that Kelly and I found ourselves force-bathing an indignant ball of fluff at 11:45 PM on Valentine’s Day. As I suspected it would be, our chicken learning curve has already been a steep one. After dunking Spotty’s rear end in a bowl of warm water and gently picking off the poop, we blow dried her and returned her to her sisters. 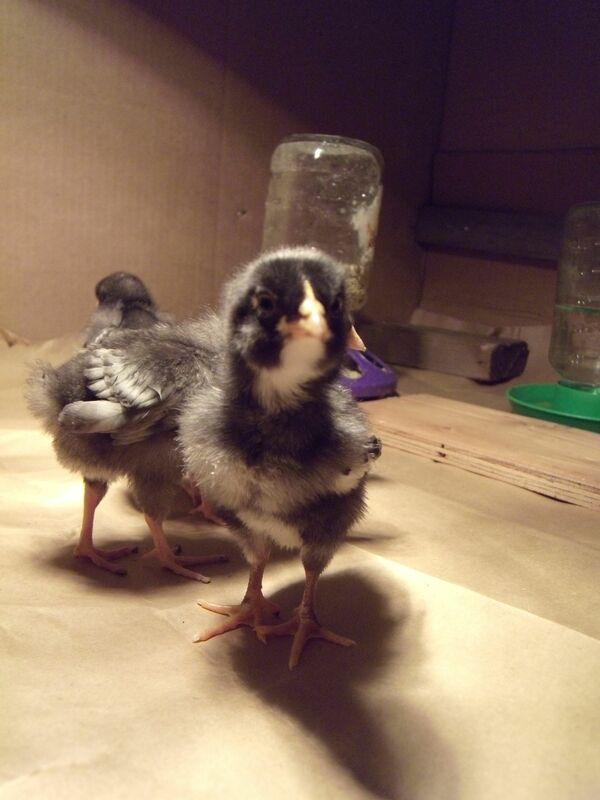 Since that first night, we haven’t had any emergencies, but we’ve learned a thing or two about our mini-chickens. 1. Chicks are noisy. The chick box is in the spare room, and though we keep the door closed, it’s easy to hear their near-incessant peeping through the night. 2. Chicks fall asleep the way people do on buses and in movie theaters. One of our greatest delights has been watching the chicks fall asleep. They can’t help themselves. A chick will suddenly stop pecking for food, and its little head will begin drifting downward, until the tip of its beak touches the ground. Then it will sink lower, and its cheek will press into the floor, and its little eyelids will flicker. And then, suddenly, it will jerk itself awake, shake off its nap, ruffle its feathers, and head off for a snack. 3. Chicks smell terrible. I think of baby animals as all having the same sweet, new-to-the-earth smell. Not so with chickens. 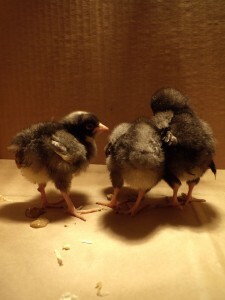 Sometimes, when I touch my nose to one of their soft little heads, I almost think I catch a whiff of good baby smell, but then the overtones of nasty chicken poop drown it out. I’m here to say that chicken poop is one of the most offensive smelling forms of excrement I’ve ever come across. I wish I could believe I’ll get over my aversion to it in the coming seven weeks of indoor chickens, but I suspect it will only get worse as they grow and produce more of it. 4. Chicks grow fast. Really fast. By Wednesday afternoon, Kelly and I could both tell that the chicks had already grown. In the past few days their wings have developed considerably, and they now flap a few times as they run to get away from us in the box. They eat all the time, and it certainly seems to be paying off. 5. Chicks can make other pets (like cats) very jealous. Pudy seems to be torn between wanting to hunt them, feeling unnerved by them, and feeling abandoned and rejected by the humans in the house. Despite our best efforts to assure her that we still love her, and to introduce her (from a safe distance) to the chicks, she continues to slink around the house and claw the back of the sofa when we are in the chicken room. This evening we’re headed back to the feed store to pick up the flock’s final member: a three-day-old Barred Rock chick. We hadn’t originally planned to get Leghorns; in fact Leghorns have a reputation for nasty temperaments (and phenomenal egg production!). Barred Rock birds are said to be very mild-mannered and friendly, as well as good egg-layers, so we figure she’ll be an excellent addition to the flock. 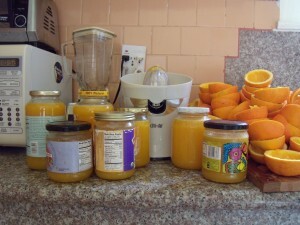 This morning I squeezed 66 navel oranges to freeze the juice. 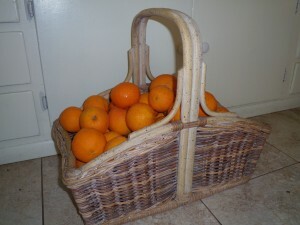 They’ve been falling from the tree since January, and a few were starting to grow mold in the basket. 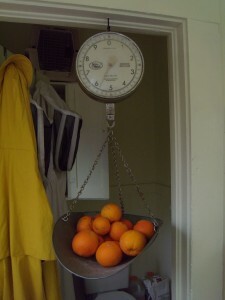 Of course I couldn’t resist getting out my rummage-sale-find-of-a-lifetime hanging scale. I seem to have a thing about record keeping. It’s not that I always jot down how many hours I spent weeding on which date, or the weight of the third tomatillo harvest. When I do, though, it gives me an inexplicable sense of joy and satisfaction. Call me weird. Kelly will have nothing to do with record keeping, and I can see her eyes begin to glaze over as I ramble on. The oranges weighed in at just about 26 pounds, and their juice filled seven variously sized recycled jars (I haven’t yet attempted the math on the number of ounces, but that will come). I’ve often wondered how much money we save by growing fruits and vegetables, and whether we save any at all when our time and garden expenses are factored in. Coming up with exact numbers has seemed daunting, if not impossible. This morning’s orange harvest has me inspired again, and I figure I might as well start today at approximating how much we’d be spending if we were to buy the organic produce that we grow in the garden. There are obvious weaknesses inherent in such estimations. For instance, I suspect that if I were to factor in the hours we spend tending the garden, I would find we are eating hundred dollar tomatoes. One could also argue that homegrown food is worth more because it tastes better and is fresher, and therefore higher in nutrients, than anything you could buy at the grocery store. For me, gardening is both a spiritual and a practical endeavor and feeds my soul in ways that aren’t quantifiable. Even so, I find myself curious as to just how much money we might be saving by packing our yard with edibles. I have it on good authority that the Whole Foods Market down the road (where we very sadly resort to buying much of our food) is selling organic navel oranges for $1.69/lb. My orange squeezing marathon would have rung up at $43.94. Yikes! This is a good reminder that we would probably forgo many of the foods we eat if we weren’t growing them ourselves. At that price, juice concentrate starts sounding downright appealing. My plan is to begin keeping track of the selling price for the foods we’re growing and compiling this information so I can take a look at what we’re saving over time. Hopefully this will serve as an inspiration, not only to up our efforts in the garden, but also to make sure we don’t let food go to waste—something that can be all too easy. Operation Ivy, phase two, upon completion. The owners of the apartment building just to the west of our garden must have planted ivy on the chain link fence years ago. All the good light is on our side, so of course the ivy is eager to nose its way into the garden. It’s no exaggeration that ivy is one of the banes of my existence, and every time I visit my local nursery, I’m amazed to see that this plant is still sold. Shouldn’t invasive, impossible-to-get-rid-of plants be illegal? 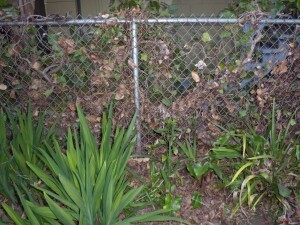 Last weekend, armed with my trusty Felco pruners and an array of shovels and rakes, I faced the jungle. And none too soon. One of the things I hate about ivy is that if you let up, even for a few months, it comes back stronger than before. It doesn’t seem to matter how harshly you cut it back, or how thoroughly you try to dig it up. It always re-sprouts. Though I might be tempted to use chemical herbicides when it comes to both ivy and Bermuda grass, Kelly won’t hear of it. My only recourse, it seems, is to attempt to exhaust the ivy before it exhausts me. 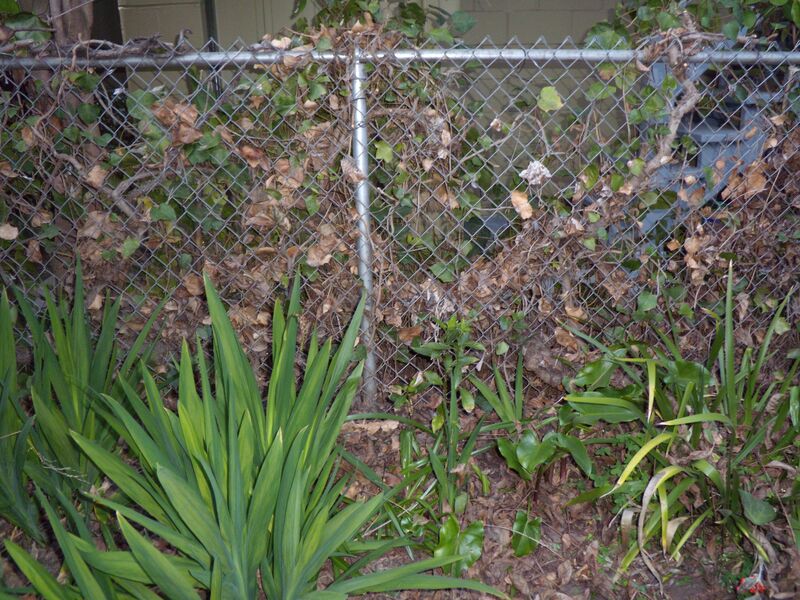 I first tackled the ivy several months ago. Fearful that the neighbors might object, I left a little growing on our side of the fence. Like I said, the ivy desperately wants to be on our side of the fence, where it can bask in the sun. Growth on the neighbors’ side is stunted at best. This time I wasn’t so generous. Any ivy on our side got cut, and I amassed three large piles along the driveway. I have to say, the vine is looking more scraggly and yellowed than before my first attack, and I’m hopeful (perhaps prematurely) that my efforts will ultimately pay off. I discovered much to my regret, however, that the ivy has managed to work its way into the bases of both a palm tree and a suckering redwood. It has also taken root in a few places well away from the fence on our side. 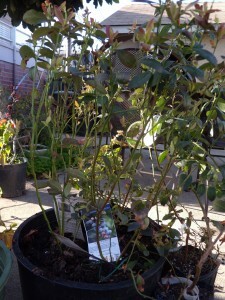 Six 'Misty' and 'Sunshine Blue' await transplanting. The battle is far from over, but I’m determined. Lest you question my use of vocabulary related to war, this stretch of garden will soon be home to new bare root blueberry bushes, as well as the first (and only) apple trees I ever grafted. I’m loath to plant my babies in a place where they could well be smothered down the road, but I’m also running out of space for all the things I want to grow. The ivy must go. 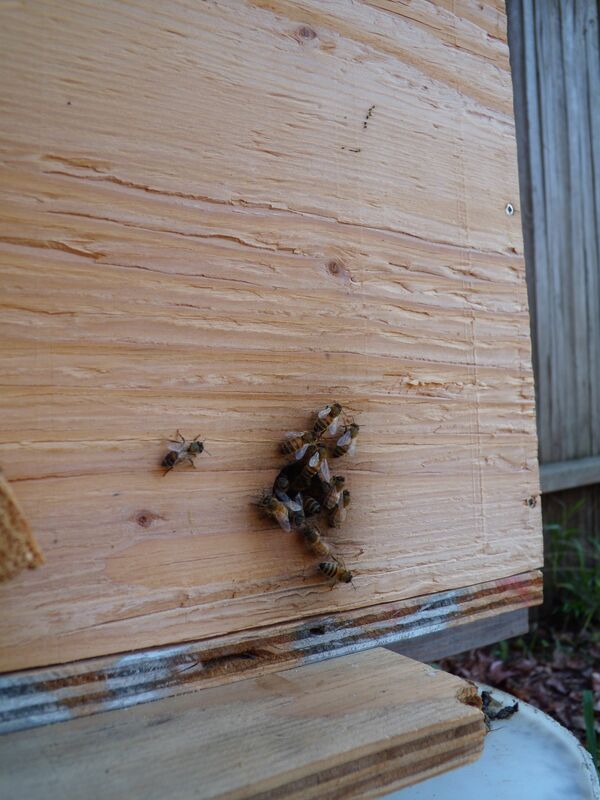 I am pleased to report that the mite count has dropped significantly on our top-bar hive, Mondo’s, bottom board. Compared with the 30+ mites we were seeing before, the five mites I counted on the board a few days ago were a relief. Besides the mites, pollen, and bits of wax and debris from newly drawn comb, we also saw one wax moth larva nosing around. 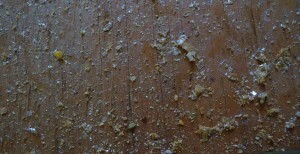 The “bee eggs” and “antennae” we identified during our last bottom board inspection were absent. The bottom board, as it looked on our most recent inspection. The red spot down low and in the center is a mite. You can click the picture to get a closer look. 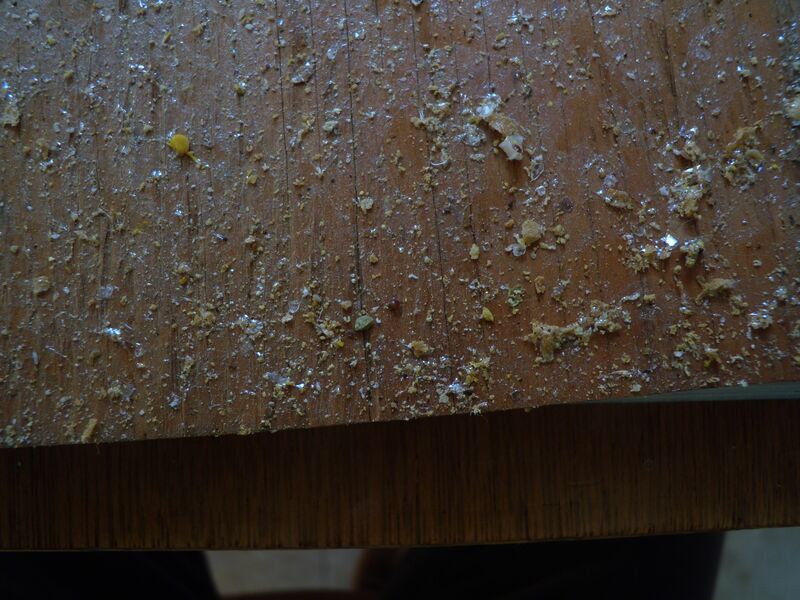 After the monthly Bee Guild meeting last night, we were able to ask a few much more seasoned beekeepers whether they thought our identification of bee eggs on the bottom board was plausible. The folks we talked to scratched their heads and suggested that we may have actually been seeing wax moth eggs. Kelly remains unconvinced, and if I ever see the tiny translucent pearls on the bottom board again, I’m going to bottle them and bring them along for show and tell at the next meeting. In the meantime, a preliminary google image search for “wax moth eggs” hasn’t yielded anything helpful. The weather continues to be unseasonably sunny and the hard frosts of early January have given way to comparatively balmy nights. The bees seem to be taking full advantage of the weather. They’re bringing in loads of white and bright yellow pollen and are staying out into the early evening. We’re not sure what all they’re foraging on, but the loquat in the front yard is still in bloom. I’ve also seen (and smelled!) blooming acacia, and yesterday I watched one of the girls collecting nectar from Oxalis just outside the hive. Here’s to noxious creeping perennial weeds that double as winter forage for bees! Welcome home! 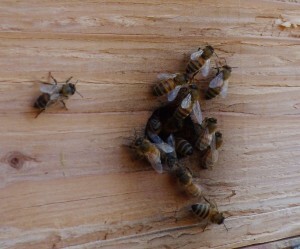 Bees greet each other at the entrance of the hive. The sweet meat in its youth. A year ago in winter, Kelly and I spent several evenings at the kitchen table poring over seed catalogs and dreaming up our garden. As usual, our little gardeners’ hearts did most of the deciding, and our spatial judgment was severely, if temporarily, impaired. That is to say, we ordered too much seed for our growing space and our busy schedules. 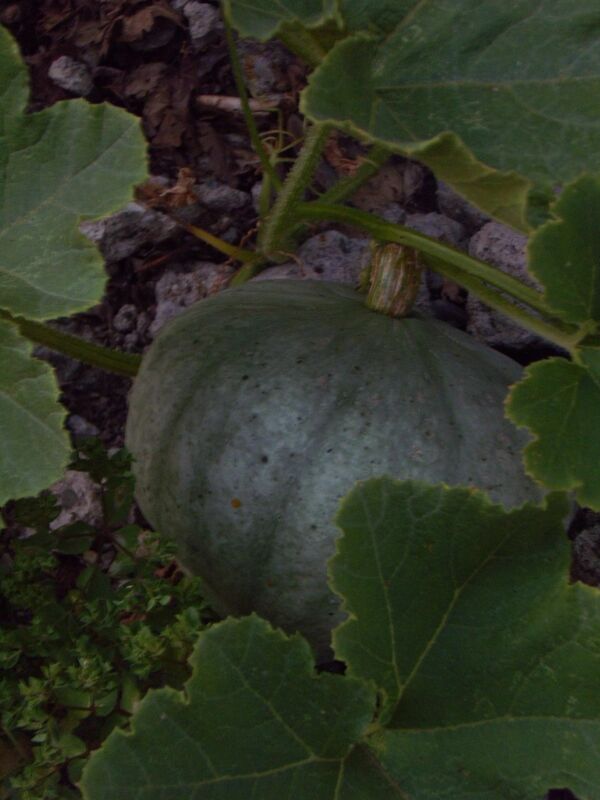 Among our more space intensive crops was “Sweet Meat” squash. I started seeds in the greenhouse on March 27th, and eventually planted a baby squash out in the orchard. It blossomed profusely and set a grand total of one squash. This was probably all my fault. I was unaware that squash should be planted in pairs, at least, for optimum pollination, and by the time Kelly informed me of this fact, it was too late. Fortunately, that one squash grew quite large, and we managed to save it from gnawing squirrels and rats by fashioning a makeshift chicken wire cage around the fruit. Since I harvested it on September 21st, the nearly 9 lb. squash has been sitting on our kitchen counter turning from gray to dusty rose. Yesterday, with the task of making dinner, and stern instructions not to cook up another bag of frozen pot stickers, I braved the squash. As it turns out, I use the word braved quite literally. Wielding our biggest kitchen knife, I plunged the blade deep into the sweet meat and attempted to leverage it in a downward arch. Unfortunately, given my limited upper body strength and the squash’s impressive proportions, this maneuver proved impossible. Long story short, I ended up enlisting the help of my 200 lb. little brother who, with much knife wrenching and muscle flexing, managed to halve, and finally quarter the beast. Phew! I baked the wedges for upwards of two hours at 350 degrees in the covered pan usually reserved for turkeys and large chickens. I added a little water to the bottom of the pan and drizzled some olive oil on top. The final products: a ground turkey and squash hash with carrots and kale which I cooked on the stove, and a baked squash dessert consisting of one sliced fuji apple, a handful of raisins, a drizzle of maple syrup, a sprinkle of cinnamon and (drumroll) squash. This I baked for an additional hour and a half at 350 degrees, also covered. We ate the squash and turkey hash, which Kelly described as “homey” and “very hippie,” and then moved on to dessert. I’d considered pouring coconut milk over the top, but we opted for heavy whipping cream instead. 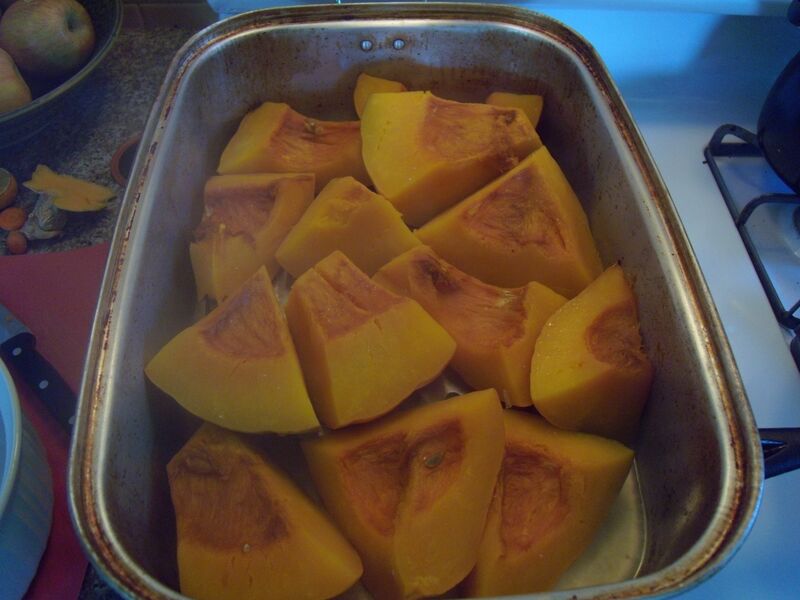 Heavy cream is our dessert condiment of choice these days, and it did wonders for the baked squash. Honestly, though, I was impressed by the sweet meat overall. 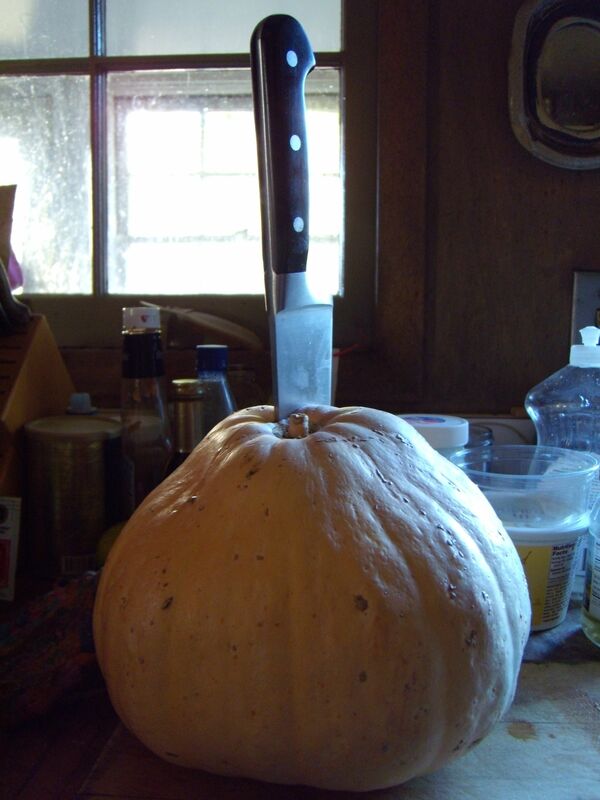 It was sweet, without being overly so and had a good nutty squash flavor. Kelly has promised to make squash soup with the remaining wedges, and I’ll be sure to report how it matches up against the other squash creations. In the meantime, the worms got the baked squash skins, and I’m drying the seeds to plant this spring.